It is so far impossible to carry out a democratic electoral process in the Donbas regions outside Kyiv's control, Dmytro Razumkov, the speaker of Ukrainian presidential candidate Volodymyr Zelensky's campaign headquarters, said. "As regards the war in the [Ukraine's] east and the Minsk Agreements, 'Minsk' [peace process] is really not ideal, there are a lot of questions related to it, this matter has been stalled for many months, but no one unfortunately can suggest another option. All of these sanctions, which today are in effect against Russia, are linked to the Minsk process, and it will be very difficult to change this whole process," Razumkov said at the third forum of the Ukrainian Liberals in Kyiv on Saturday. The Minsk peace process is quite acceptable with all its imperfection, he said. "The other point is that Russia is trying to turn everything upside down, as usual, and proceeds in reverse order by holding elections in the first place. This can be called whatever you like, but it is just impossible to carry out the democratic process on the occupied territory today," the speaker of Zelensky's campaign headquarters said. Therefore, the only way to settle the Donbas crisis is undertaking joint actions by Ukraine and international partners, primarily by using diplomatic methods, he said. 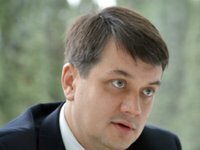 The return of the "occupied territories" of Donbas and Crimea should take place only on Ukraine's terms, Razumkov added. "Our country made its civilized choice long ago," the speaker of Zelensky's campaign headquarters said, commenting on Ukraine's course towards European and Euro-Atlantic integration. "This [the choice] was confirmed in 2014 by the deaths of people on the Maidan during the Revolution of Dignity, this is confirmed by the fact that the Ukrainian army protects our sovereignty in the country's east. But it is still a hard way we will have to go," Razumkov said. "As we are speaking about the integration into the North Atlantic Alliance, it is certainly really important, and unfortunately or fortunately there is no alternative to Ukraine's advancement in this direction," he added. At the same time, Razumkov urged politicians not to speculate on this matter.